An East Bay community is outraged after seeing a noose hanging out of pickup truck in the middle of a shopping center Thursday. San Leandro police received multiple calls about the noose, tracked down the truck owner and ultimately resolved the issue with a discussion. 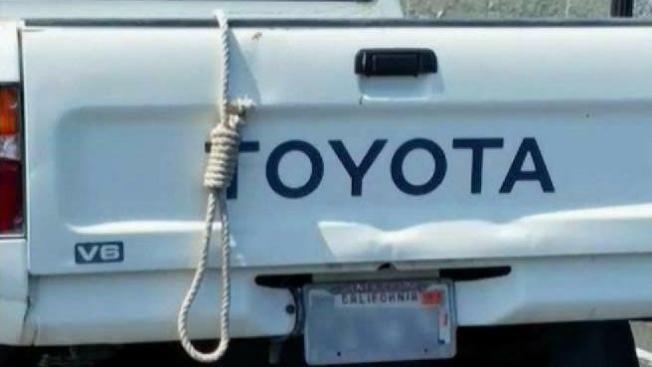 "We have an obligation to look into the matter to find out why this individual is driving around and displaying this noose," San Leandro police Lt. Isaac Benabou said. "Is he trying to intimidate? Is he someone we need to know about? Is he the victim of a crime himself?" Police said they were made aware of the noose the day after it circulated on social media. They said it's not necessarily a crime, but it clearly disturbed some people who saw it. "That was upsetting to me and frightening," San Leandro resident Michael Locher said. "I stopped. I do a double-take. There's a lot of people around. It's a busy area, a diverse area." Locher spotted the noose Tuesday in the Pelton Center parking lot. He snapped a photograph and posted it to Facebook. The truck owner told police he lives outside San Leandro and put the noose there for his own personal reasons. He said he didn't mean to offend anyone. Displaying a noose is not a crime unless it's coupled with a hate crime or direct intimidation, police said. But they still talked to him. "Just educate this individual as to the insensitive displaying of the noose, and he was receptive to that and removed it," Benabou said.